Have you ever taken a road trip and you don’t think you have to go to the bathroom until you have driven right past the sign that says that the next rest stop is another 20 miles away and you have to muster up your energy to hold it in for the next 20 miles? Or have you ever missed your exit and this mistake adds another 30 minutes of traffic onto your trip when you were already running late? That makes for a very difficult and frustrating road trip, but once you finally get to where you were hoping to end up, you are thankful you made it there safely which makes the destination beautiful, no matter where you end up. These difficult road trips are like the journey of recovering your mental health and the journey of life in general. As we go through life, we experience a lot of difficult times, we hit a lot of potholes, and get a lot of flat tires, both literally and figuratively. We go through life and we can easily miss out on opportunities. Sometimes we drive past the opportunities presented to us going 90 miles per hour to avoid them at all costs, and other times we drive by the opportunities like we would the rest stop, not fully aware that the opportunity was even there. Some days, we might think we are on the right track, to only find out we have been driving on the wrong highway for hours. It can be incredibly frustrating to make a mistake, to make a wrong decision, or to spend hours longer on an activity that should have taken you a few minutes. Even though this is incredibly frustrating and can lead to a lot of bad days, you are only human. Find comfort in that statement, that you are only human. You are far from perfect. And you know what? That’s okay! You are going to make mistakes, you are going to take the exit on the left by accident even when the GPS is telling you to stay to the right. We are all going to make mistakes, but those mistakes help to mold us, they help teach us patience, they help create growth. We often get frustrated with ourselves for our mistakes and our failures, but there are so many beautiful lessons in those failures. Find comfort in the fact that even if today, you messed up in more ways than one, or you are still over-analyzing that mistake you made 6 months ago, that those experiences will only help make you stronger and teach you something about yourself and what you want in this world. There is a blessing in every lesson. After these mistakes, the next time you are on that highway, you’ll remember to take the right exit or to stop at the last rest stop. And if you happen to make that same mistake again, laugh at yourself and your imperfection, and just try again. That’s really all you can do, is keep trying. The bumps in life are inevitable, but you have a choice to let the bump tear you apart, or to grow stronger than that bump and keep pushing forward. Moral of the story is this, no matter what pothole you hit, or what traffic you face, you have everything within you to carry forward, to finish the ride, and to reach the most beautiful destination. Everything always works out exactly as it should, when it should. Find comfort in that, find comfort in relinquishing control, and knowing that the exit you missed, was likely a blessing in disguise because at the next exit, there is something even better for you. Life and healing are both truly unpredictable. I wish I could tell you that my healing journey was easy, but it wasn’t. And even though it wasn’t easy, it was the best choice I could have ever made for myself. So remember, that some days are just going to be pretty crappy, but if you can remember that you are not alone and that we are all on this incredibly messy journey together, you can continue to push forward. I find comfort in accepting that those bad days are inevitable. I accept those bad days with open arms and know that they will make me appreciate the happy days that much more. 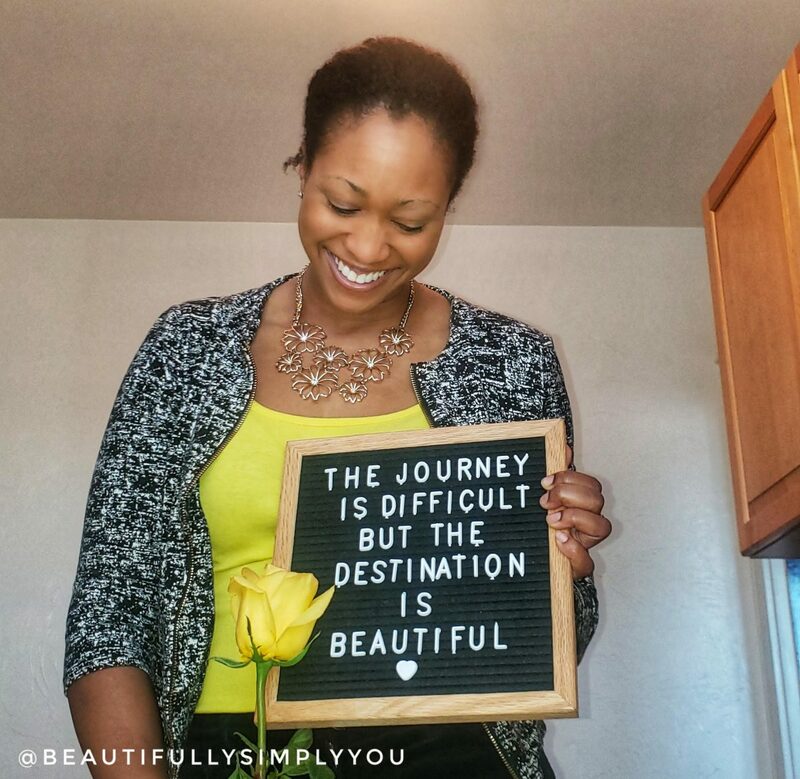 Even though this journey of recovery and healing is difficult and often confusing, once you finally get to where you belong, where your heart feels at peace, you recognize that the difficult journey was worth it, because the destination is so very beautiful. All of the bumps along the way were so worth it because you finally reached the ultimate destination, the destination is coming home to you, the person you were always meant to be. Be patient on this journey. I am right there with you.